Hello everyone! In continuing the BOBS theme, I have another awesome find to share with you all, Sensible Strands. 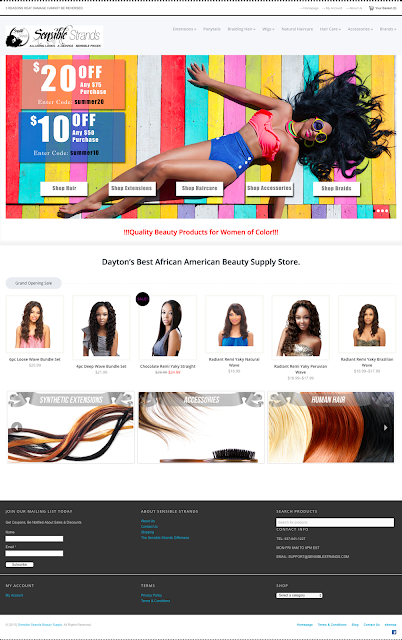 This is an online beauty supply store founded in 2015 and owned & operated by Ray Stephen out of the Dayton, OH area. What I really like about this business is their goal is to provide an option for ethnic women as we are under appreciated in the beauty industry. Read more on their About Us page. Their product lines range from wigs, to weaves, to haircare, etc. All orders $50 and over ship free. In playing around with their shipping calculator, I found First Class Mail is a flat $2.45. Priority and Express vary by location and of course, the farther from Dayton, the more expensive but overall probably better than any price out there. So definitely check this site out, I'm sure you'll find something you like. If you do check it out leave a comment below.